Doctors and nurses should be stationed at close intervals throughout the city. Keep a list of all people in your neighbourhood who are trained at CPR, and organize training for more people to be versed in it. - Try to control bleeding by applying direct pressure to the wound with a clean, bulky material. Elevate the wounded area to reduce blood pressure to the wound. If the dressing is blood soaked, do not change it but rather add new dressings on top. Tie dressings in place with strips of cloth or roll bandages. - Arterial bleeding is marked by bright red blood spurting out. If the injury is to the scalp, neck, groin or shoulder, it can be difficult to control the bleeding and can lead to shock. - With open wounds there is always a danger of infection. Wash out the would with soap and clean water, then dry quickly and apply clean bandages. If no clean water is available, urine is quite sterile and can be used for cleansing. Raw honey is also mildly antibacterial and can be used to prevent infection and speed healing. - To create new sterile dressings ahead of time, cut cotton fabrics into strips and boil for at least 10 minutes. Allow to dry thoroughly, preferably in sunlight. - Cuts tend to bleed enough to clean the wound and are therefore not as prone to infections. To treat a minor cut, close with butterfly bandages or stitches. 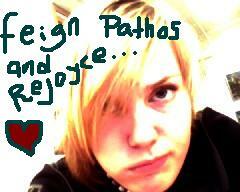 - In stitching larger wounds, use only a sterilized needle and thread. 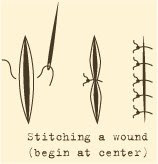 Pull the sides of the wound together, and begin stitching at the center of the wound. Tie off each stitch individually. - Puncture wounds might leave foreign material inside the flesh or can get infected. Therefore it’s best to get punctures treated by a medic. Only assist a choking victim if it is clear there is no air moving (no coughing or breathing sounds). Ask the person if they are choking, as they will still be able to hear you. In case of choking, apply the Heimlich maneuver immediately. STEP 1: Stand or kneel behind the victim and wrap your arms around the upper belly. STEP 2: Make a fist with one hand and grab the outside of the fist with the other hand. The thumb of your fist should be above the belly button but below the breastbone. STEP 3: Point your elbows out, and vigorously thrust your fist upward into the victim’s belly. This is to force air through the windpipe to blow the obstruction out of it. STEP 4: After four abdominal thrusts, try four sharp blows between the shoulder blades to dislodge the obstruction. STEP 5: Repeat the series of 4 thrusts and 4 blows until the obstruction clears. Do not stop unless the victim passes out, in which case artificial respiration will be required. - Check the victim’s pulse and breathing. Keep the victim still. - Do not move the broken limb or attempt to set the bone back in place, as this could cause further damage. - Hold the affected body part in place with a splint or a sling, including at least the joint above and below the injury. Use a firm material in a splint such as a board or broomstick, and pad it with towels or rags for cushioning. - Lay the victim flat and elevate the feet, unless a head, back or neck injury is suspected. Call for a medic. When a joint is sprained it will usually display soreness and welling, indicating the internal tissues have torn. Standard treatment is covered by the acronym RICE, which stands for Rest, Ice, Compression and Elevation. - Stay off the injured limb. Apply cold compresses for the first 24 to 48 hours. Do not apply ice directly to the skin, but insulate ice packs with a towel or folded cloth. - After 2 days, massage the area and soak in hot water, or alternate between hot and cold soaks, to boost blood circulation. Elevate the limb and compress the injury with a snug bandage wrap to help control swelling. - Immobilization is key to proper recovery. Pulled muscles can be treated by applying cold compresses immediately and elevate the limb to control swelling. If the pain begins to subside, apply hot compresses after 24 hours. If the muscle does not improve in two days, seek medical attention. Useful for semi-conscious or unconscious patients. Use extreme caution when carrying a person. Avoid back injury to yourself by keeping your back straight and using your legs to lift. STEP 1: With the patient lying on the floor, stand at his feet, stepping on his toes, and grasp his wrists. STEP 2: Pull gently, and when he’s close to you, crouch down and pull him over one shoulder. STEP 3: Pass an arm between the patient’s legs and grasp his arm nearest to your hands. Useful for conscious or semi-conscious patients. 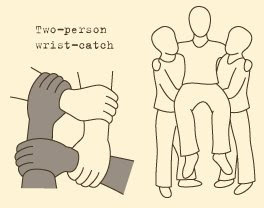 STEP 1: Two people, each person grabs her left wrist with her right hand, then with her left hand grab the other person’s right wrist. This will form a square with the 4 forearms. STEP 2: Both people bend down, keeping backs straight, and allow the patient to sit into the square of forearms. The patient puts her arms around each person’s neck for stability. Hei, I love this initiative. if you use tread made of flax fibres it will disolve in the wound so you don't have to pull it out. This might require restiching for larger wounds, but it will still work. It's what the romans used. I hope you'll add something about burns, when people start relying more on wood stoves and such the risk of getting burns increase.